You may have noticed somethings a little different around here and no its not just the happy look on my face! Although the new love in my life; the Canon 600D is certainly something to smile about. So I owe a massive thank you to Bloggabase for the Amazon vouchers I won to inaid me to get back in the blogging game, no more excuses! Ripped jeans are having a bit of a moment, but I'm surprised its taken me this long to get around to DIY'ing one of my many black skinnys. I was like a mother having to choose which child I loved least. Finally this H&M pair made the cut, possibly because they were the cheapest so if your feeling anxious at the thought of destroying your trusty jeans perhaps put the scissors down and grab yourself a £14.99 trial-price pair to get snip-happy with first. Tears shed = Priceless! 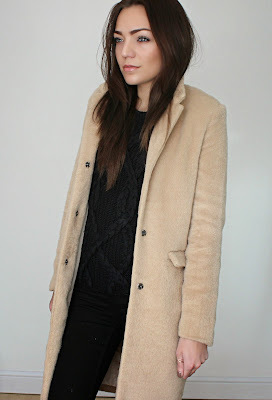 Love the coat, a perfect neutral colour you can wear with either another neutral like black or even colour! Interesting how you mention your new camera as I have spent most of today reading about the best cameras for fashion blogging. Love what you've done to your jeans too!